Asphalt drum mix plants are develop considering the rough application that this equipment will be subjected to. 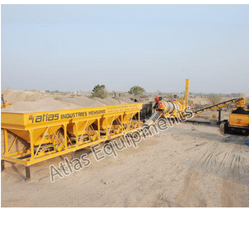 Atlas is Indian manufacturer of road construction machinery with focus on implementing products with latest technology that offers maximum benefit and highest savings to the customer. Being a quality oriented organization; we are presenting Asphalt Drum Mix Plant. Our offered drum mix plant is designed with top grade material under the direction of professionals. This drum mix plant offers ease of operation and better fuel savings. Offered drum mix plant is available in numerous customized options at affordable price to our renowned clients. 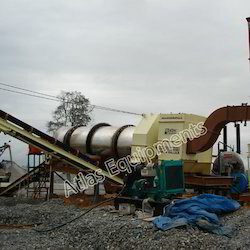 Source highest quality asphalt drum mixer from Atlas. We are leading and one of the oldst manufacturers of road construction equipment in India. PLC control panel a standard with all export plants. Cold aggregate feeders come in usually four numbers. these four bins are for storage of cold aggregates as per the different sizes. Each bin is equipped with radial gates for flow control. Each bins is also equipped with variable speed drive motors so that the speed can be controlled from the panel itself. This is a simple single deck screening unit. It is for removal of oversized material. Charging conveyor that comes with the plant is equipped with a load cell. This conveyor transfers the cold aggregates from below the screen to the drying and mixing drum. In the process of transfer, the cold aggregates are weighed. Most important part of the asphalt drum mixer plant, this unit plays a very important role in the production of hot mix asphalt. The drum uses burner to heat the cold aggregates as they move from one end of the drum to the other end. In the first half of the drum, they are treated with hot burner flame while in the second half they are mixed with bitumen and filler material. The drum is covered with SS coated sheet (export plants) and insulation of creawool that can resist 1260 degree Celsius. Special designed flights are designed to be of maximum efficiency combined with our multifuel burner to give maximum savings. These flights help to quickly reduce the moisture content in the aggregates. Dry dust collector helps in trapping bigger dust particles as they move from the drum towards the secondary pollution control device. the collected dust particles are removed and can be resuded in the mix. Wet dust collector will trap small dust that may have escaped the dry dust collector. It is a very effective means of pollution control device used with asphalt mixers. Bag filters can also be supplied with the equipment. Load out conveyor equipped with a heat resistant conveyor takes the hot mix asphalt from the drum to the waiting trucks. Depending on your requirement, bitumen storage tanks ranging from various capacities can be provided. Tanks can be provided with direct heating or with indirect heating.Each bitumen tank comes with suitable sized burner for proper heating of bitumen. Filler material can be added in the mix by use of the mineral filler unit. The recycled dust can also beused to add in the drying drum besids bitumen. Suitable capacity fuel tank is provided with the hot mix plant. Internal cabling and all accessories are included. Just need to bring main cable and connect it to the power source. You can use this plant continuously without breakdown and by paying little attention to the maintenance part of the equipment - such is the smooth and error-free design of this asphalt drum mixing plant. If you are looking to source quality machine look no further than this machine since it includes all the components that you require to produce quality hot mix. Above these asphalt drum mixing plants are designed to perform for years to come.